GEOCONCEPT, the leading publisher of geographical optimization technologies for professionals, has been included in the Magic Quadrant for Field Service Management by Gartner*, the world leader in IT research and consulting. As part of its annual study on the FSM (Field Service Management) market, Gartner evaluates technology providers on their ability to execute and completeness of vision. 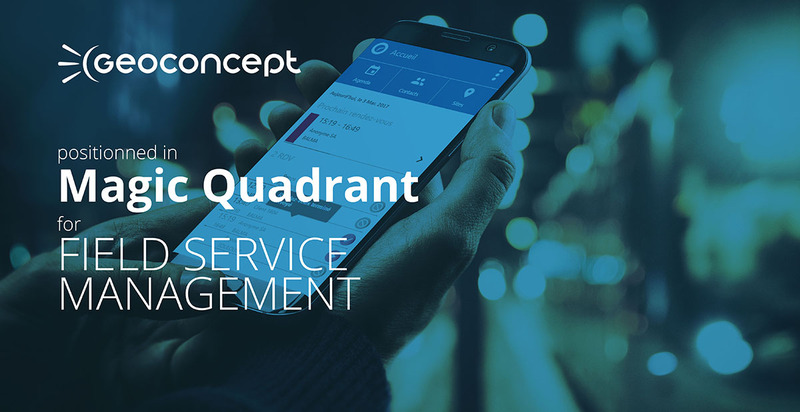 « We are delighted and honored to be positioned in the Gartner Magic Quadrant for FSM, which we believe recognizes our expertise in the field service management solutions market. We feel this recognition encourages us to continue our drive to innovate and adapt to our customers’ future needs, by integrating their new technologies as artificial intelligence, connected objects - IoT etc. It also gives us the confidence to step up our international development efforts beyond the EMEA area ». In addition to its optimization capabilities, GEOCONCEPT also owes its status as a go-to market player to its recent innovations, notably its long-term strategic scheduling module, its analytics tools and APIs. *Gartner Report “Magic Quadrant for Field Service Management” published 27 September 2017, by analysts Jim Robinson, Jason Wong and Michael Maoz.